Our booth at the Spring Mother’s Day Market in Wainwright. Our first show was the Spring Mother’s Day Market in Wainwright, Alberta (where we live) and let me start by saying this show did not go well! I’ll get into that in a moment but as you can see above here was our booth so I’ll start with that. We have done shows in Wainwright before where we had just a table. I thought having all my things on one table made them look cheap and garage sale-y and that set people up for sticker shock when they saw the price tags. Tables run about $50.00 so it’s a minimal investment but display is severely limited. We decided to try paying for a 10′ x 10′ booth and see if that made a difference. We knew we were doing both indoor and outdoor shows and our booth spaces this year would be either 5′ x 10′ or 10′ x 10′ so the both needed to be convertible to either size. I designed the booth on graph paper and my husband built it for me out of 2 x 4s and bead board. We spent about $400.00 on supplies and paint for our booth. The boards slide into the pillars we created so it collapses down to just boards and the five box pillars for transportation. Still, it takes an hour to set up all going well. We used IKEA style screw systems that have drop in metal components that go into holes my husband drilled in the boards so they can be repeatedly screwed together and unscrewed without worry of stripping the wood. We were concerned that we didn’t want the booth to be able to fall over on other vendors displays or blow over in the wind so it is very sturdy and pretty heavy too. The booth was well received. Everyone said it looked great and it did display everything quite nicely. The problem with this particular set-up above seemed to be the bench I had in the middle with the pillows on it. People seemed reluctant to come into the booth and walk around. It might have been better not to have anything in the middle. That said, the quilt draped over the end of the bench received many compliments because it was front and centre. The biggest issue with this show was a lack of advertising on the part of the event organizer. It was also the first really nice weekend of the spring and people wanted to be outside. They did not want to be in a community centre shopping. I had about $3,000.00 worth of products at the show and I sold one $30.00 pillow. That was it! I paid $160.00 for the booth space and donated $37.50 worth of items to the swag bags. So the show was a loss of $167.50 and two days. We knew shows in Wainwright (a town of 6,270) would not be highly successful but we did not expect such a failure. The other problem with this show was the majority of vendors were selling commercial direct sales items like Tupperware, Scentsy, Usborn, Origami Owl etc. and we were selling handmade. It was definitely not the right show for us but all of the vendors around us complained that sales were very poor or non-existant. The take-away from that first show was: not all shows are created equal. The show organizer(s) play a big role in vendor success. Also, you will not always get a return on investment on things like swag bag donations. The organizer had offered free swag bags to the first 50 attendees on both days and this resulted in a crush of people at the beginning who grabbed their bags, almost ran through the show and left in less than half an hour without spending a dime. After that show we laid low for the rest of the Spring and then signed up for the local Farmer’s Market. This involved a membership fee of $20.00 and then it was $10.00 per day every time we attended as vendors. We also had to buy a 10 x 10 tent awning which cost just under $200.00. 1. People are there to buy food. 2. Sometimes they will buy handmade items. In that case, clothing items sell well (especially for babies and kids). 3. You never know if you will have a good day or a bad day at the Farmer’s Market. That being said, our first day at the Farmer’s Market went well with $130.00 in sales. Covered notebooks and bags were popular. We also got to meet local people and get our name out to them. Then we had a few days where we sat out in the wind and sun all day with zero sales and that was the end of the local Farmer’s Market for us. The other thing that was not so great was that the market was in an unpaved parking lot so the wind was whipping the dust around and also blowing merchandise down. Things would land in the dust and get dirty. Also being on a hot dusty parking lot in blazing hot sun for six hours was very unpleasant. Do consider the location and the implications of that before you pay for a membership. What about a bigger town? We tried going to a Farmer’s Market in a bigger centre. We went to the city of Lloydminster (population 27,804) which is an hour away. We thought that might bring in more sales. We sold nothing of handmade but my son made about $10 selling his fresh lettuce for $1 or $2 a bunch. We only tried that once because it seemed like quite an investment of time and gas to go sit in our tent and make no money. I think it we had gone more often though people would have gotten to know us and sales might have picked up. That market had a $10 membership fee and a $20 fee per day that you attend. Again it was in a parking lot but this time the lot was paved. Perhaps if we tried the Farmer’s Markets in Edmonton (metropolitan population 1.3 million) we would do better. There are quite a few handmade vendors in the Edmonton Farmer’s Markets. That is a two hour highway drive from here though. Corner Booth at the White Barn Market. Another market we signed up for was the White Barn Market which was near Thorsby, Alberta and was in a field on a farm (which had a white barn of course). This market went much better than the Farmer’s Markets. I felt like I was home at this market. It was all handmade vendors. Not a piece of Tupperware in sight. The first date was in the middle of August and I sold about $260.00 that day. Which seemed like a lot compared to the other shows so far this year. This market is very well advertised and promoted by the organizers plus there is usually a food truck too that’s awesome. Many people from nearby cities such as Edmonton and Leduc come out to this market for a pleasant day trip. The first week my booth was on a corner so that offered more exposure. People would also shortcut through my booth which was disconcerting on the one hand but they often saw things that caught their eye that way. Plus I got to meet one of my blog followers Ioleen that day so that was fun. On the way there we had one of our trailer tires lose its tread and the tire blew on the way back. We had hoped to get to Leduc (half an hour to 40 minutes from Thorsby) as we had a tire set aside for us at Canadian Tire but we had to abandon our utility trailer on the side of the highway. We did get the tire before they closed though and all was well in the end. Except that ate up $113.00 of our profits. The second date a couple of weeks later we did not have a corner booth and overall attendance was down quite a bit. We only sold about $132 that day so it definitely was not worth the 5:00 a.m. wake-up and the six hours on the highway there and back. Plus, I spent $93.00 not counting food and gas! Definitely we didn’t come out ahead but it was a fun day. My kids really enjoyed the barn kittens that were roaming around. The take-away from this market was: making more sales was fun but there’s more to factor into success or failure than sales. If we lived closer we would do this market again but with the distance and the kids this one will not work. In August I tried my first “Loonie Night” in Lloydminster. It was $30.00 for a table. Attendees pay for bidding paddles with numbers on them ($3.00 each I think) and they can bid a loonie (Canadian dollar) on items that vendors have up for bid to try to win them. The vendors get all the $1.00 bids for their items hopefully reaching at least their price on the item. The attendees get a chance to win a nice item for a dollar. There are usually three rounds of bidding and between rounds the customers can also shop at the vendor tables. The vendors each get one bidding number for free and they can purchase more numbers if they wish. It’s called Loonie Night because bids are a dollar and in Canada our dollar coins are called “Loonies” because they have a loon (water bird) on them. At the end of the night a gentleman approached my table and offered to buy a quilt and two pillows from me. He had had quite a few drinks and was very bold and persuasive in getting my price down by 50%! He convinced me that he was donating them to a charity auction and I really hope he was telling the truth. I granted the sale because I really felt I needed to make more money on that event but I basically just got my materials back by discounting 50% and gave my time away for free. That didn’t make me feel very happy. The takeaway from the Loonie Night: Choose your events carefully. An event that devalues your wares is going to make you unhappy in the end. Also, getting too desperate to make a sale can cause you to make a bad decision that you will regret. At first I was feeling like the night was a success because I made over $200.00 but when I really sat and thought about it, say on the hour long highway drive home in the dark, I realized that it wasn’t so successful after all. The best market of the year, and of my handmade seller’s life so far, was the Etsy Made in Canada Pop-Up in Edmonton in September. This event was first class! The organizers did an excellent job promoting the event in the months and weeks leading up to it. They were even on the local news stations on the lunch-hour news! There were promotions to entice people to attend and social media efforts were huge. There were also over 200 vendors who were also sharing on their social media so that helped too. We traveled to Edmonton the night before and stayed at my Mom and Dad’s house. They looked after our three kids for us. We booked our dog into a kennel. We were up very early for a 6:00 a.m. load in time. We left the van and the trailer loaded so we could just get up, get showered and get out the door without waking the whole household. The load in, while intimidating, went very well. I was so glad I chose the earliest time slot because I really did need all that time to get set up. Next year we will design a simpler booth! The booth at the Etsy Pop-Up. We were starving by 8:30 and the show started at 9:00 but fortunately there was breakfast available to purchase from the Shaw Conference Centre where the event was held. The first day was a Saturday and it was an amazing day. I sold over $700.00 of items including a quilt. The second day was a Sunday and it was not such a great day with only about $70.00 in sales. I’m not sure why things didn’t go so well the second day but everyone who came by my booth seemed to be just looking. For next year I think I will concentrate on making three or four items but making a lot of them. I think I had too much to choose from this year. When you factor in $240.00 for the 5′ x 10′ booth space, fuel, dog kennel, food, parking and a whole weekend of time I’m not sure that $700.00 was successful. If we had had to pay for a hotel and childcare on top of that it would have been a break even situation if we were lucky. It was great to be at a show where people were actually coming for original handmade items and were interested in buying those items. I felt like I was with “my people”. The people who “get it” were there. The takeaway from the Etsy Pop-Up: Being in a larger city at a curated and juried event that was well promoted was a great experience! I recommend giving it a try! I did another Loonie Night in October and again in November (both in Wainwright) with the same feeling that my items were devalued. I won’t be doing anymore of those but I had committed to the October and November dates. I was really dragging my feet to the November one. I don’t recommend those events for handmade sellers. The booth at the Christmas Expo. The last show of the year was the Christmas Expo in Wainwright. After the Mother’s Day fiasco I was very hesitant to sign up for this one but the organizer (same one as the Mother’s Day) caught me just after my big exciting show in Edmonton and I handed over my $180.00 for a 10′ x 10′ booth. It was our year of experimentation after all so we would try this one last show. We also had to buy $20 worth or raffle tickets bringing our total cost to $200.00. Over two days we made $297.00. This was the best ever total for Wainwright but still not what I would call a success. At least we didn’t lose money this time. I did have fun selling but I think two days was too long for a small town like this. 1. This is hard work! It is an unbelievable amount of work. The sewing alone is daunting and when you add in travel and set up and tear down… it is not for the faint of heart. 2. You are never guaranteed sales and you never know what will happen. 3. You still need to try a few shows yourself and see what works for you with the knowledge that you might not make money. You might even lose money. 5. It is not fun when people balk at your price and try to whittle you down. Don’t stand for it! 6. There is a considerable amount of money outlaid up front in supplies and booth fees and you are not guaranteed to get that money back. 7. Small towns are generally not going to be successful for handmade seller in my experience. Go for the big city shows. The conversion rate statistics are so low that you really need a high number of people going through to make enough money. 8. It is a very good idea to have an online shop where you can list everything that doesn’t sell at the show. I didn’t ever sell out of everything but my online sales were the best they’ve ever been this year. Join the Daydreams of Quilts Facebook Group! Thanks Anita for your honest and thoughtful recount of your year of selling handmade at markets. I am in a similar situation and so I read with interest. What a year! Thanks for your thoughts and I'm really sorry that things didn't go so well. I have done a few shows and I can relate to everything you went through. Sometimes people treat you like you are having a garage sale and every price is negotiable. Do they do that with every vendor or just the quilty ones? Anyway, I'm so disillusioned about craft shows that I don't think I will ever do another one. Unless, I can think of something to make that will blow people's minds! And it has to be a quilt related item. I have an Etsy shop and I hope to get in the Etsy pop-up market next year. Like you, I have to find those items that might sell and just have a few big ticket items. One time I had this quilt that I had priced at $700- and my friend thought that was too much. I told her it only takes one person. Needless to say I didn't sell it but I had lots of interest in it. I do better after the shows selling stuff to my sister and my friend. Do you do any kind of custom quilting like t-shirt quilts that you could leave a card at the local quilt shop? I have made a few bucks doing that. And it's not hard and the client is supplying most of the fabric. Just a thought. It's hard to create beautiful things and not have a market to sell them in. And all you want to do is create! I was thinking of doing the 'One Of A Kind' sale in Toronto but booths are $1000- a day. And I know it only takes one quilt sale a day but what if you sell nothing. 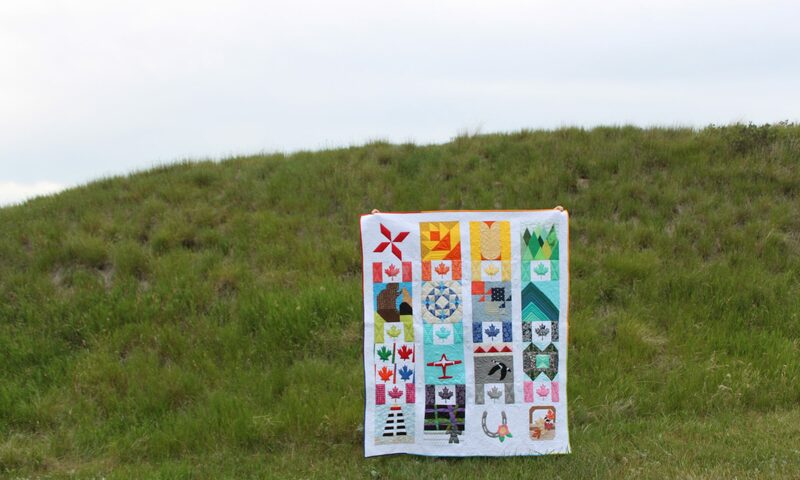 Good luck in your future endeavours and keep on quilting! Found your article interesting as I also have done shows. I stick mostly to holiday shows at local high schools and such. I also try to make some smaller less expensive items for the customers as many onlyw want to spend $10 or so dollars , but thise are the ones that add up. Like you said, they balk at quilt prices! You're welcome Raylee. It's a tough go! I think online is the best. I'm still looking for the perfect combination of products, demand and show for in person sales. Thank you Kathy. 🙂 Yes, the lower priced items are the good sellers. Especially things for kids. I sold quite a few crayon portfolios at the summer market at the White Barn. Thank you Mary-Kay 🙂 At least I know what shows not to do next year. Ha ha! But yes, it is hard when you put so much time and money in up front. I found Etsy was very successful for me this year. $1,000 a day! There's no way! That's a big risk to take because as you say – what if you sell nothing! But on the other hand… what if you sell almost everything? Who knows what could happen. Ventures into craft shows are learning experiences for us all. Knowing the venue & market you will be selling in helps too. But we do learn, hone our craft show skills and do better the next time out. It always help to have less expensive items for sale because certain venues attract bargain shoppers. 2) Create some flyers and put them up along the route to the craft fair/citywide yard sale days, etc at local gas stations or grocery stores about my booth. Of course you need to put them in places you can ride through to take down on way home. 3) Make some totes bags (using remnants or older stash) to sell or use to put in merchandise at a certain sell point i.e. spend $20.00 get a handmade tote bag. 4) Create a personal notecard for yourself with information on what/where you make/sell and ways to reach you. You can have these made at like a Staples where you can get several 100's of cards made for a low price. Shoppers may not buy at that venue but may want to buy more expensive items later. I am looking into a very large convention venue next year and thinking about the crowd. I know that I will need to make some things of interest for this religious crowd along with my quilts. So I am planning now. I talked to a couple of the convention attendees I saw in a local restaurant to see what type vendors were there. No vendors were selling items I am considering. I am planning to work with some other local makers to share a double large booth with me so that we can be there everyday and have enough to sell all days. Lots of planning to do but I have started my making now. The crowd attendance had been in the 1000's. A captive audience in my opinion. Let the making begin. I too hope that you have better craft shows in 2018. You now know what venues are around you so now you can plan more readily for each venue or see what other venues are available. Wishing you a better 2018. Thank you! It certainly has been a learning experience. So far I still prefer to sell online but we'll see what happens in 2018. I did hand out quite a lot of information cards and business cards so that was a good thing to have on hand for sure. Thank you for sharing your experiences at shows. I understand exactly how you feel about trying to sell handmade pieces especially when you are at a show that has a majority of vendors selling commercial items. That happened to me this year at our local Craft Show… people were in a frenzy buying bath bombs! Because I live in a very small town (pop. 1700), I honestly did not expect too much, but people weren’t really interested in handmade on the whole. They threw their money on Tupperware for crying out loud! On the plus side, my table was cheap in comparison to your shows, as I only paid $20. In addition, I felt that exposure was all important… even in a small town, where everyone knows everyone, not all know my hidden talent as a quilter. Another thing that I learned this year, is that I need to downsize the number of items that I bring to the show… it was probably too overwhelming visually. I tried a show this year for the first time in a while. What I realized was I hate everything about doing shows: packing, preparing, & pricing my stuff, setting up, taking it down, & most of all, sitting there all day! Selling doesn’t come naturally to me & I find it stressful. People walking through, looking at your things, walking on. All that work & after one day I sold one $7 item. I backed out after Saturday, packed up & didn’t return for the next day— just couldn’t do it. I found a lot of other vendors said they did very poorly too; the crowd looked but didn’t buy. I am exploring a couple of other options including trying to drum up more business in my Etsy shop, & renting a spot in an artisan type shop in a bigger centre. Like you, a friend of mine who was fairly successful at the show circuit figured by the time you factored in gas, fees, expenses, it wasn’t really worth it. If you come up with a magic formula, please let the rest of us know! What is it with the bath bombs eh? LOL! So sorry you had the same situation as me but thankful you only spent $20.00 on your spot. I agree on the downsizing. I believe people were overwhelmed at my booth. Often they would stand there and say, "So much work. Wow. So much work" and then walk away. Thanks for commenting! Ugh! So sorry that you had such a poor experience at your show. That is so frustrating! Etsy is where it's at that's for sure (in my opinion). It's awful to be sitting there thinking "I could be home sewing right now" when nothing is happening at the show. I will indeed let you know if I find something that actually works. Ha ha! Well, I guess I'm right there with the gang…had a similar year. I only did 2 shows, one in a high school in Indianapolis with a good draw of people, but did very poorly – it stormed so it kept shoppers away I think. Then a local, very small show. I did better there than the large one, but people know each other and it was a mid-November Christmas show. I did, however, get quite a few sales from people who saw, picked up, looked carefully at my stitched items and I think when they can look closely at the quality of your items, it helps. I also handed out a lot of my business cards and word of mouth helped. Over the past 3 years, I've had more and more Christmas sales. This year, I need to set a time deadline because I need to finish up for my own family. I'm certainly not making a lot of money and I've discounted my items to sell them and have decided NOT to do that any longer…our time is too valuable. Thanks for your article…good to know we're all in the same boat and can benefit from each other's experiences. Thank you Linda! 🙂 Yes, I agree… we need to stop discounting our items. It only contributes to the problem of people not understanding the value of handmade. This post certainly has brought many of us together under the same experiences. I'm happy that I took the time to write it. Here's hoping for a more profitable 2018!